We had a fun and productive field day this month. The day was spent practicing trailing skills, partly in preparation for upcoming Trailing Evaluations taking place in October. 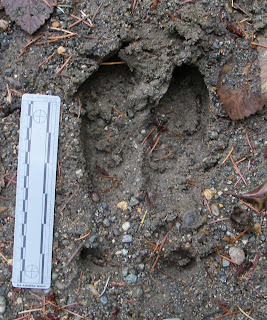 Trailing is the art of following tracks, often with the goal of catching up with the animal. The small marks behind the primary part of the foot are dew claws, which are smaller digits found further up the foot. 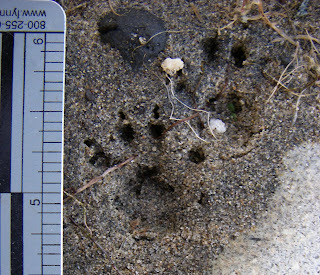 They usually only register when the animal is running or walking through deep substrate (such as the soft sand in the photo). We discovered black bear tracks in the afternoon and chose to spend the rest of the day back-tracking the bear through the swamp to learn about where it had been. It was amazing to discover that it had crossed a small log (maybe four inches diameter) over a swamp. We finished the day up the day by going over some of my slides on small desert rodents (pocket mouse, kangaroo rat, woodrat, pocket gopher, etc...) in preparation for next month's class which will be in the Columbia Basin desert of Central Washington.